1. Place the noodles in a large heatproof bowl, cover with a kettleful of boiling water and leave to soak for 15 minutes. Drain and cool. 2. Heat 1 tsp of the oil in a large wok. Pat the squid dry with kitchen paper and stir-fry for 4-5 minutes until cooked through. Transfer to a bowl and return the wok to the heat. 3. Heat the remaining oil in the wok and stir-fry the garlic and sugar snaps for 2 minutes. 4. 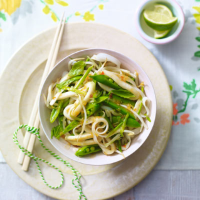 Return the squid to the pan along with the noodles, beansprouts and salad onions and heat through for a couple of minutes until piping hot. Season with sweet chilli sauce and lime juice then divide between 4 bowls and serve scattered with basil leaves. Try swapping the basil used to finish this dish with mint or Thai basil. Bottlegreen Sparkling Ginger and Lemongrass is a spicy and aromatic presse that adds depth and bite to this dish.